Ernst Theodor Wilhelm Hoffmann changed his third name to Amadeus because of his adoration for Mozart. 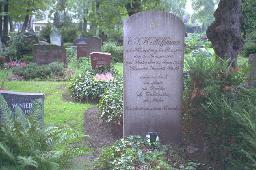 He was the son of a lawyer in Königsberg. After the separation of his parents he was raised by O.W. Doerffer, a brother of his mother. In 1792 it had became clear that he was very talented and that his knowledge was greatly superior to that of other people of his age. He went to University in Königsberg and already took his first exams in 1795. By this time he had started to draw and to paint. His mother died in 1796 and he went to live with another uncle, whom he followed to Berlin in 1798. There he met C.M. von Weber and he wrote his first composition. In 1802 he entered a job at the Court of Law in Posen. Instead of marrying his fancee Minna Doerffer he broke the engagement because he expected that they would both be unhappy (for many years he had loved another woman, Cora Hatt). In 1802 he married a pretty Polish girl, Maria Thekla Michaelina Rorer-Tracinska. In 1804 he became a judge in Warshaw. There he met Julius Hitzig, author of the first Hoffmann biography. In 1806 the French were in Warshaw, his young daughter had died and his wife was seriously ill. He was near the point of collapse when he was rescued by his friend Hippel. In 1808 he moved to Bamberg with his wife. There he became musical director and theatre architect, but he was haunted by his fascination for the 16 year old Julia Marc, daughter of a family where he taught music. After he lost his job and Julia Marc married and moved to Hamburg, he thought of committing suicide. In 1813 he moved to Dresden to work for Seconda. He loved the beauty of the city and his financial position improved. With Seconda he also worked in Leipzig, but after a quarrel he was out on the streets once more. Hippel rescued him again and helped him to a job in Berlin, where he worked at the Kammergericht. Apart from opera's and plays Hoffman wrote sinister novels and short stories. He was famous for his power of imagination as well as his drinking habits. In July 1816 his opera "Undine" was a huge success in Berlin, but after twenty performances the theatre burned down and the original material for the opera went down with it. He died a few days after completing his "Des Vetters Eckfenster". Ludwig Devrient sat at his grave for weeks and reportedly he shouted "come out!" with a bottle of liquor in his hand. His writings were an important influence to writers like Washington Irving, Nathaniel Hawthorne and Edgar Allan Poe. Work: "Undine" (opera, 1812-1814); "Die Abenteuer der Silvester-Nacht" (1815); "Die Elixire des Teufels" (2 volumes, 1815-1816). The grave of E.T.A. Hoffmann at the Kirchhof Jerusalem und Neue Kirche III, Halleschen Tor, Kreuzberg, Berlin. Statue of E.T.A. 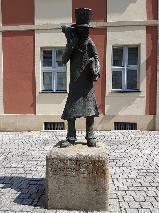 Hoffmann and his cat at the Schillerplatz in Bamberg.